I have developed a weakness for sweets in ball shape. They disappear in your mouth so quickly, you have immediately forgotten that you actually ate them. 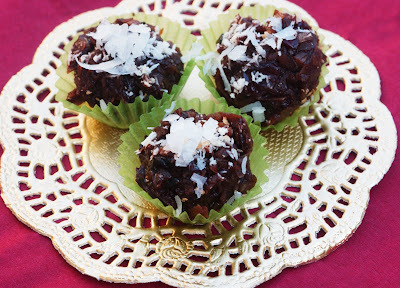 So it happened again yesterday when I pulled these Coconut Cherry Cocoa Balls out of the oven. I think I had about eight or ten of them .... yes, I felt a little guilty. To prevent me from eating the whole batch (which was about 25 balls), I dropped a few at a friends' house around the corner. She later send me a message talking about them as "Little Drops of Heaven". And this is what they are: a lovely little dessert, with a rich and dense chocolate taste topped with some fruity and tart dried cherries, lightened up with creamy and sweet coconut. DELICIOUS. Spread 1 1/2 cups of the shredded coconut on a baking sheet. Bake for about 10 minutes, or until coconut begins to turn golden brown. Set aside. In a bowl, whisk together cream of coconut, cocoa, egg whites, vanilla, and salt until well combined. Add dried cherries and the baked coconut and stir until well combined. Cover and refrigerate until thoroughly chilled and firm, at least 2 hours and up to 24 hours. Line a heavy baking sheet with parchment paper. With damp hands, Shape small amounts of the batter into balls, about the size of a walnut. Place the balls on the baking sheet, a little apart apart. Top each ball with a pinch of the remaining untoasted coconut. Bake in the middle shelf of the oven for about 20 minutes, or until the balls are no longer sticky outside but the insides still feel somewhat soft when poked with a finger. Let cool. They keep very well in the fridge.